Purpose. Naomi had felt without purpose, but now she knows exactly what she is to do. Read Ruth 4:16. 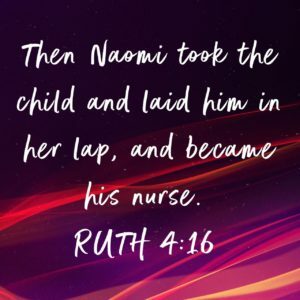 Now that Ruth and Boaz are married and have a child, Naomi becomes the nurse for her grandchild. All the care and the love that she has she now can turn that into teaching and training and guiding this young man to become exactly what God has said to be. She can explain to him all about the God who never abandoned her and who led her and helped her and took care of her in her time of need. She has a story to tell. We all have a story to tell about how God has moved in our lives. We all have a purpose for why we are here and we need to be actively seeking out that purpose and working toward it. God is good and worthy of our trust, and because of that, we can fulfill the purpose that He has for us. Are we thinking and working in our purpose today?